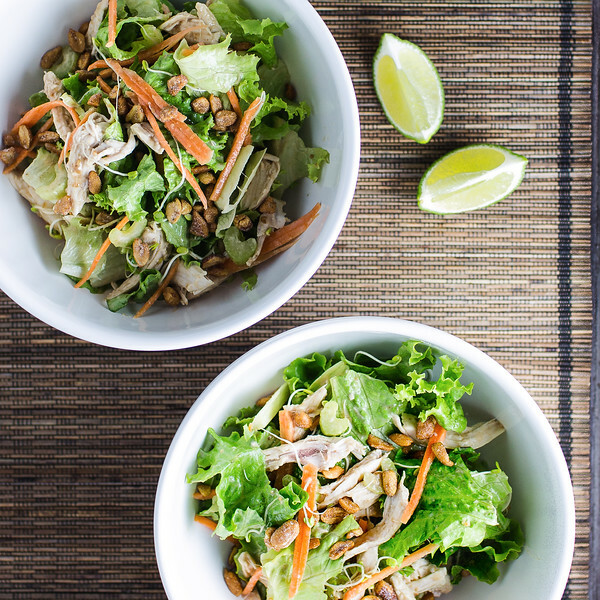 Turn rotisserie chicken into an easy, healthy and colorful Thai Chicken Salad. Coconut milk, brown sugar, peanut butter, lime juice, soy sauce, and red pepper make a spicy Thai peanut dressing that is bursting with flavor! Topped with toasted peanuts for extra crunch! Enjoy it as an easy lunch or dinner. Do you get cravings for salads in the winter? Get tired of soup and heavy foods? I do. But it’s not the time for summery salads with tomatoes and basil and all the flavors of summer. I want something a bit more creamy. Rotisserie chickens are such an easy way to get a quick dinner on the table, sometimes I do nothing more than crisp it back up under the broiler. My favorite thing to do though, is use the meat for easy soups or salads. These Brown Rice Chicken Waldorf Salad and Chicken and Sweet Potato Farro Salad are two favorites. Rotisserie Chicken – use shredded breast meat from one rotisserie chicken, can use dark if you prefer. Romaine Lettuce – can use kale, spinach or a blend to increase the nutrients. Fresh Bean Sprouts – some stores have stopped carrying them because they can harbor bacteria. To get that same crunch, you can thinly shred some cabbage or just increase the carrots and celery. Carrots – shredded. A food processor or a box grater makes this easy. Lime Wedges – for serving. Coconut Milk – can use light coconut milk if you are counting calories. Fresh Lime Juice – Fresh lime juice really does taste better than bottled! Soy Sauce – lower sodium if you are watching your salt intact. Ground Red Pepper – can use more if you like it hotter. This is a quick and easy salad to prepare! Make the mouth-watering Spicy Thai Peanut Dressing by combining the coconut milk, brown sugar, peanut butter, lime juice, soy sauce and pepper in a small saucepan. Over medium heat, bring to a boil, while stirring. Reduce the heat and let it simmer for about 5 minutes to thicken up. Remove from the heat and let it cool for about 2 minutes. While the dressing is cooking, tear the lettuce into bite sized pieces and place in a large bowl. Shred the breast meat from a rotisserie chicken and add to bowl. Add the bean sprouts (if using.) Shred the carrots and slice the celery and add to bowl. This is a Cooking Light recipe that I modified a bit. 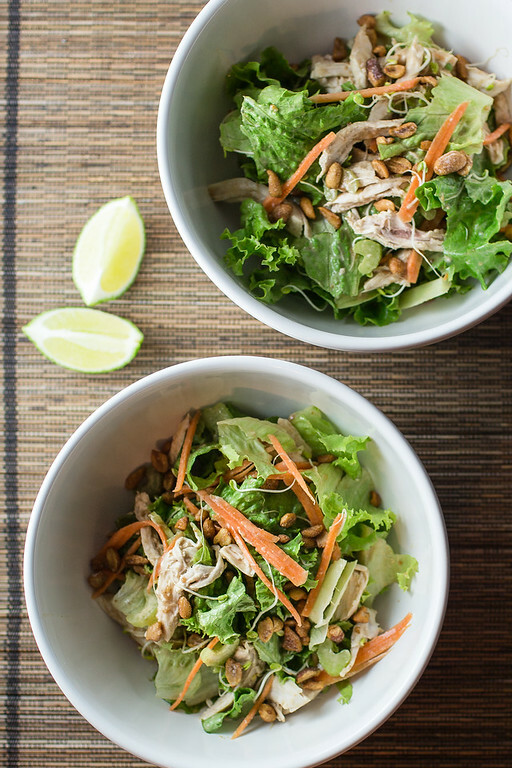 If you make this Thai Chicken Salad with Peanut Dressing, be sure and leave a comment and let me know what you thought. You can also post a photo and tag me on Instagram! One of my favorite ways to use rotisserie chicken! Fresh veggies and rotisserie chicken gets lots of flavor from a peanut dressing! Combine the lettuce, chicken, sprouts, carrots and celery in a large bowl. In a small saucepan, combine the coconut milk, brown sugar, peanut butter, lime juice, soy sauce and cayenne pepper, and bring to a boil, stirring. Reduce heat and simmer for about 5 minutes or until it thickens slightly. Remove from heat and let cool for 2 minutes. Pour over salad and top with peanuts. Serve with lime wedges. Rotisserie Chicken - use shredded breast meat from one rotisserie chicken, can use dark if you prefer. Romaine Lettuce - can use kale, spinach or a blend to increase the nutrients. Fresh Bean Sprouts - some stores have stopped carrying them because they can harbor bacteria. To get that same crunch, you can thinly shred some cabbage or just increase the carrots and celery. Coconut Milk - can use light coconut milk if you are counting calories. Fresh Lime Juice - Fresh lime juice really does taste better than bottled! Soy Sauce - lower sodium if you are watching your salt intact. Ground Red Pepper - can use more if you like it hotter. This post was originally published in 2016 and updated for 2019. Oh yes, this is my kind of salad! I bet the dressing would make a great dipping sauce too. Thanks so much for this recipe! That peanut dressing sounds absolutely awesome! Love this salad recipe! This sounds like a great salad and one that we would really enjoy! Hope you are enjoying your day and thanks so much for sharing your awesome post with us at Full Plate Thursday! Looks like such a gorgeous, fresh and tasty salad – perfect for a taste of spring! Scheduled to pin. Thank you so much for sharing this with Hearth and Soul, Pam. I’m hoping to make it myself soon as it’s right up my street! Hope to ‘see’ you at Hearth and Soul again this week. This is a delicious salad for our hot, hot summer. The lime makes it zing. It contains as much bean sprouts as lettuce! That’s pretty amazing. Looks like a good salad, Pam. Thai chicken salad looks delicious, thanks for sharing with Hearth and soul blog hop, pinning and tweeting. Your Salad looks delicious! Thanks so much for sharing with us at Full Plate Thursday. Hope you have a great week and come back to see us real soon! yummie ! This looks good ! I love how different from my ‘normal’ salads this is! I totally need to try this out! I like your recipe – no fish sauce and I’ll swap the peanuts for cashews as I’m allergic to peanuts. I think this will our Friday night dinner as I’m back at work this week and its a nice easy meal to put together. That looks great, I am going to make that for my Chinese New Year gathering.